Today I have a 3D Holiday Tree to show you. 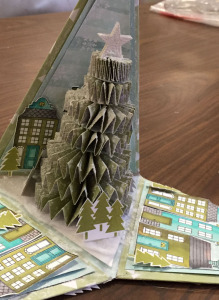 I used this 3D tree for my display at our public Library’s Festival of Trees. Local businesses each place a Christmas tree on display throughout the Library for the Holiday season. 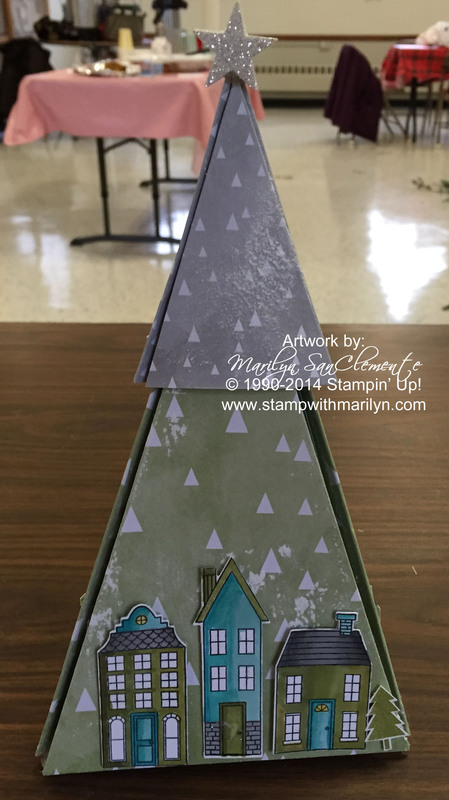 The inspiration for this 3D display was a picture that I saw from the Stampin’ Up! European convention. I am not sure who designed it, but I CASED it and made up my own pattern for the tree. 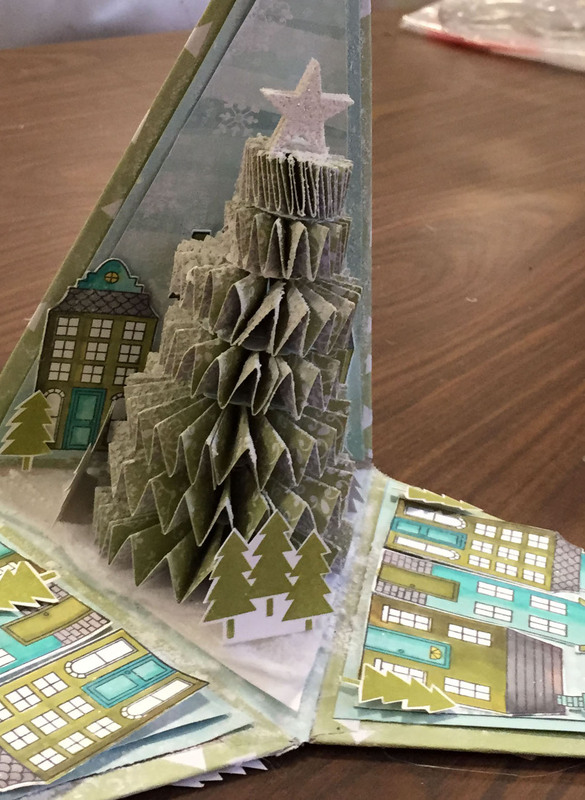 The Designer paper is All is Calm with the houses and decorations stamped from the Holiday Home stamp set. 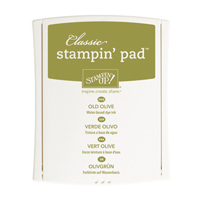 The Houses are stamped with Momento ink on Whisper white cardstock. I colored in the houses with the new Blendabilities markers and cut them out with the coordinating framelits. The framework of this display is 3 long triangles. 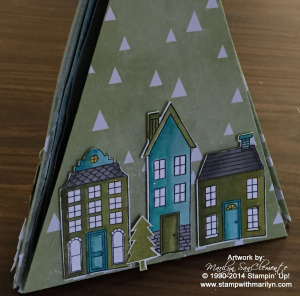 I used a smaller triangle for the middle base that the center tree is o n.
Each side of each triangle is covered with the All is Calm Designer Paper. The center triangle is covered with the designer paper and then a layer of white cotton snow that you use around Holiday displays. The inside tree in the center of the display is a set of 7 lollies that I made using my Big Shot and the Designer Rosette Die. 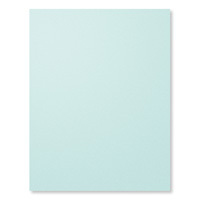 Each layer is 1/4″ smaller than the previous layer starting at 2″. A glue gun is used to stack the lollies together. 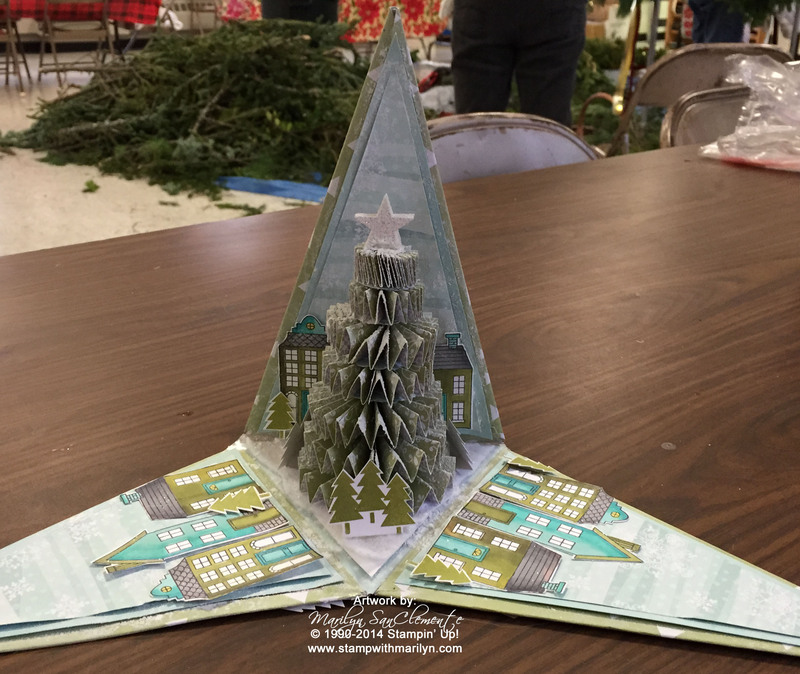 The star on top of the tree is made by punching out several stars from Silver Glimmer paper using the Itty Bitty Punch pack and layering them together with dimensionals. To hold this display together, I made a “cover” from a smaller set of triangles that I cut from another pattern of the All is Calm designer paper. 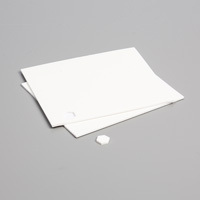 Each Triangle is scored at 1/4″ on the two long sides and folded and attached together with sticky strip. I attached a second star to the top of this triangle. As a final touch, I used a can of the spray snow that you can purchase in a craft store and sprayed the outside of the finished display. 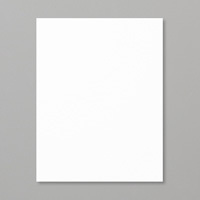 NOTE: It did curl the designer paper a bit. I hope you have enjoyed this little project that I made this year… How will I top this for my display next year? ?